Once upon a time, marketing was relatively simple and straightforward. If you had the money to achieve widespread reach, it typically paid you back. Those days, however, are gone. Today, marketing is a complex ecosystem and one that moving companies must tackle if you want to see success. When exactly did things start to change? Well, the marketing landscape transformed dramatically in the 1990s — the internet was the new kid on the block, and integrated marketing was only a buzzword that the cool kids used. Fast forward to the early 2000s, and you begin to see real change with the rise of social networks such as MySpace and Facebook, Google’s IPO, and the burgeoning use of email and search engine marketing (SEM). Today, things are more complicated. In addition to social media, there’s video content, apps for mobile devices, data analytics, and the need for strong content marketing. Determining which marketing tactics are right for you can make your head spin. But that’s why we’re here, to give you an overview of what’s available and what will work best for your moving company. In this eBook, we’ll touch on what you need to know to make sense of your options and to chart a path toward achieving winning results. We’ll admit, marketing for moving companies is something we could write a whole book on (actually, multiple books. Maybe we will!) For now, this guide is intended as an introduction to familiarize yourself with a few of the most essential concepts of marketing, how they will benefit your businesses, and a few actionable tips and tricks to get you moving down the path of success. If you’re a small-to-medium-sized moving company, have just started a moving company, or are a marketer new to the industry, this guide is for you. We’re here to help you succeed, so let’s get started! Key Takeaway: Modern marketing is vast, but you don’t need to do everything all at once. 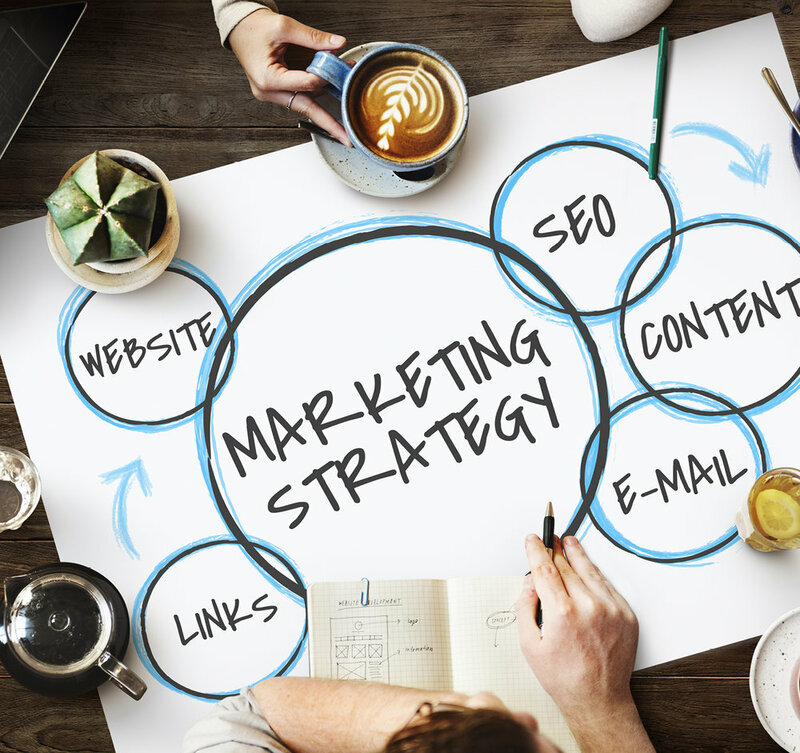 Leveraging a few key marketing techniques, over time, can result in huge gains for your business. The evolution of marketing has led to a revamp of how information about businesses — both large and small — is presented. Today, there are five major aspects to consider: customer experience, content, social, mobile, and analytics. If you’re not sure what they are, why they matter, and where to begin, that’s OK. Let’s take a closer look, together. While all of the elements we’ll touch on in this guide are crucial, customer experience trumps them all. In today’s competitive landscape, you can’t afford to deliver a subpar customer experience. This applies to every touch point – whether customers are interacting with you on Facebook, reading your blog, requesting a quote from your chatbot, or calling about a moving-day issue. To provide the best customer experience possible, you need to figure out what it is that your audience wants. Are potential customers primarily interested in cost, or is it the level of service that matters to them the most? When you’re able to figure out how to make the experience mutually beneficial for both your business and your customers, it’s a win-win situation. Customer experience for large moving companies is often a whole department in and of itself. But just because you don’t have hundreds, or even thousands, of trucks out on the road, that doesn’t mean you can’t learn from the big guys. Read how Jorja Coulter — VP of Customer Experience & Quality at National Van Lines — approaches customer experience. Your content is your primary weapon – it’s the lure, hook, and reel for your audience. Content refers to all of your online written copy, whether that’s a how-to guide you offer as a free download and lead incentive, an eBook you’re publishing, blog posts, social media posts, website copy, or your local information listed on your website. Content needs to be informative and engaging — leading potential customers through the decision making process and ensuring that their final choice is you. According to Neil Patel — one of the ultimate gurus of digital marketing — 61% of consumers are influenced by custom content, while 78% of consumers believe that businesses that create custom content are interested in creating valuable and lasting relationships. If you want to be perceived as someone’s moving company for life, you’ll want to invest here. We’ll dive deeper into the importance of quality content, and tips and tricks of the trade, a little later in our blogging section. If you’re eager to learn more about what exactly content marketing is, and how it is applied, here are a few of our favorite content marketing resources. From the Content Marketing Institute, we love this brief definition of what content marketing is and how you can get started. We’re also subscribers to the Moz methods. So, check out Moz’s Beginner’s Guide to Content Marketing. Looking for more information on exactly why content is king? Scrunch gives you 5 reasons on exactly that topic. As a form of content, social media is much more than just Facebook posts, although the platform does remain one of the more critical elements of a strong social campaign. In addition to Facebook, there’s Twitter, Instagram, Snapchat, Pinterest, and a slew of other social platforms. The most important thing to keep in mind when adopting a social media strategy is to concentrate on connecting and interacting with your audience, building trust and rapport, and leading them from your social media channels to your website — where they’ll ultimately receive an estimate and book their move. But, how do you do that? You need to create and provide content that potential consumers are going to find valuable and then post it on social. Whether that’s an article about the best ways to pack food when you move, or bios on your website introducing the friendly faces of your drivers, this is content that potential leads will find engaging, click on, and then be driven to your website. 71% of consumers who have had a positive experience with a business on social media are likely to recommend that business to others. The concept of driving leads to your business through social is conceptually straightforward — post things that potential leads will find engaging, familiarize them with your business, and gain their trust as a dependable moving company. However, putting a concept into action is often harder than it sounds. For more information on planning your social strategy, check out Hootsuite’s How to Create a Social Media Marketing Plan. According to the Pew Research Center, about 77% of adults in the U.S. own a smartphone, while Google states that, globally, over 50% of searches are now done from smartphones. This makes mobile responsiveness for websites of the utmost importance. Though lots of people still surf the web on their PCs, a growing number just grab their phone and start searching. Think about your own web behavior – how often are you watching TV on the couch and surf the web from your phone at the same time? Probably pretty often. That means your customers are doing the same. WIth shrinking screens and increasing speed, your website must be optimized for mobile visitors who need answers quickly. Everything you implement from this eBook, or with your marketing in general, needs to be done with mobile in mind – literally, everything. There are a variety of factors that go into the speed (or lack thereof) of a website, everything from redirects to images that are too large. But before you dive into speeding up your website, you should know how fast or slow it’s already performing. There are tools available which will tell you exactly how fast pages are loading. How fast should your page load? As fast as possible, obviously. Your load time affects your rank on search engines as well as your conversion rate. If you keep a web visitor waiting, they’ll move on to the next moving company more quickly than you’d think (or like). According to Kissmetrics, web browsers expect sites to load within 2 seconds and many will abandon a page if it does not load within 3 seconds. If the tool above says that your website loads in more than 3 seconds, don’t freak out. There are steps you can take to increase the speed of your site. The important thing is to aim for lightening speed and then take steps towards speeding up your time. Here are a few suggestions to get you started. Analytics is something you probably already use and don’t even realize. It refers to all of the information that your business has access to, including email lists, the average cost of a job, and where your customers reside, just to name a few. Properly leveraging data can be a challenge, but it’s essential that you do. Keeping track of metrics, such as the increase (month over month) of new customers you are booking in different regions is crucial. It’s important to identify and learn which data makes the most sense for you to track and then leverage tools to help you analyze that data. Many of the larger moving companies and van lines have embraced the age of data and analytics, but smaller moving companies are still hesitant to take the leap. Many small businesses say that the cost of adopting analytics platforms is the major hindrance. They assume the cost is prohibitive. In a recent study conducted by IDG — and reported in AdAge — the majority of businesses surveyed believed that data and analysis could transform the way they do business, but were concerned about cost. The next marketing topic we’re going to address is graphic design. Graphic design cuts across all elements of your marketing strategy. From your social media channels to the homepage on your website, graphic design is crucial to the health and success of your business. At the end of the day, it’s the artistic, visual way to build your brand. Most importantly, it creates a visual identity and consistency across your online and offline presence. It’s what makes you, you! Let’s take a look at a few ways graphic design helps to enhance and optimize your marketing efforts. When it comes to graphic design, every detail matters. Think of it this way, visuals are small snapshots of your company. You can access quality graphic design a variety of places, from freelance sites like Upwork and Fiverr to do-it-yourself sites like Canva. Of course, if you have the budget, you can always hire in-house talent. However, if you only have a few projects a years, outsourcing your designs to an expert is often the more cost-effective option, particularly for small moving companies just getting started. It’s also a good idea to schedule your own company photoshoot. Using unique photos of your business is a great way to stand out from the crowd. It also gives customers a peek into the everyday workings of your business. Customers like to have a sense of who they’re trusting with not only their well-wrapped and expensive possessions but also their boxed-up memories. The more they can relate to you on a personal level, the more connected they’ll feel to your company and the more likely they’ll be to choose your business over those other guys. 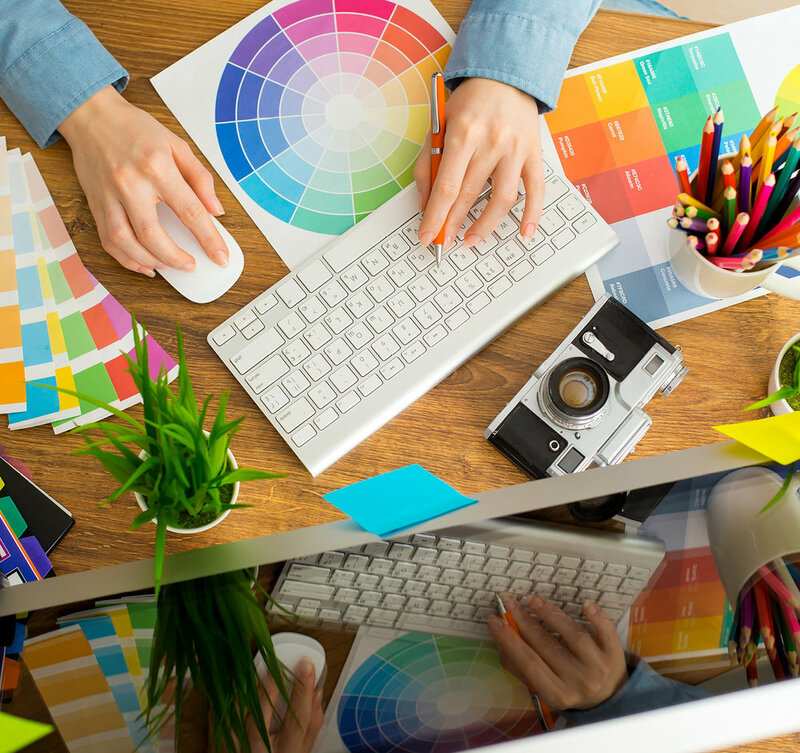 Graphic design and branding go hand-in-hand. There is no one without the other. Great branding and graphic design create an emotional relationship with your customers and/or leads. Your moving company’s brand needs to tell a story. What is your business all about? What makes you different than the other guys? If you can wrap your mind around these three concepts and apply them when creating collateral for your business, you’ll be in great shape. Another way to stand out from the pack is through infographics. They’re great tools you can use to break down complex facts and figures into straightforward, digestible chunks for your audience. 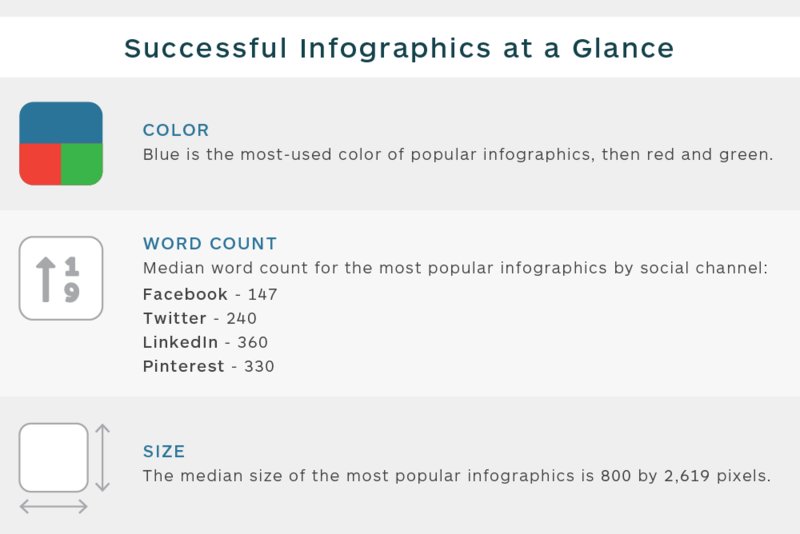 You can easily create your own infographics with sites like Infogram, Canva, and Easel.ly. So whether you are breaking down your pricing tiers, explaining the number of boxes needed, or showing off the most popular zip codes in your market, infographics can provide your customers with valuable information in a memorable format. When it comes to graphic design, the best advice we’ve ever given (or received) is to template everything. When in doubt, template it! Creating a one-pager for sales to distribute to prospects? Great! Put together a mockup of the design and save it as an editable document on your computer or on your team’s shared drive. The next time you go to create a similar piece of marketing collateral, you won’t have to start from scratch. You can use the same templates time and time and time again with only minimal adjustments. Templates simplify your life, save you both time and money, and create brand consistency. As you work to develop your designs, remember to make sure that you’re clearly capturing your unique selling proposition – your unique identifier. This is whatever makes you stand out from the competition and makes you, you. A great example of this in the moving industry is Flatrate Moving in New York City. They decided to create a social media campaign that encourages followers to snap and post photos of the company’s moving trucks “in the wild” for a chance to win cash. The Flatrate Moving brand can obviously be described as personable, engaging, and fun. Think of your business as a method actor, it needs to stay in character at all times. Key Takeaway: Graphic design is crucial to telling the story of your business, but it doesn’t have to be expensive. Concentrate on building the face of your brand while leveraging free and inexpensive tools. This is an eBook about marketing your moving company – if you do not have a website, your business will not survive. If you disagree, please skip to Chapter 4. Now that we know you care about your website, let’s dive into the details. The bottom line is, without a website, your business will suffer. When it comes to making your website stronger than your competition and turning it into a conversion machine, there are some pretty basic how-tos and pitfalls to avoid. This chapter will cover the essentials you need for content, structure, and wow factor. Modern websites are a far cry from what they once were. Gone are flashing lights, pop-ups, and animated graphics. Today’s consumers are a lot savvier than they once were, and if your website doesn’t deliver the experience they expect, they will take their business elsewhere. Below are a few of the key elements that are important to your website. Quote Generators: Every single page of your website should have a quote generator. Once a potential customer is convinced that they should give you their business, you don’t want to waste time. Make it as easy as possible for them to contact you for a quote or generate a quote right on the spot. Most moving companies are aware of this, but too many have failed to act. Putting a quote generator on every page of your website gives potential customers a shortcut to the answers they need. You’re guaranteed to snag their attention in one way or another. Not sure where to find one of these? Don’t worry, there are easy-to-implement customizable quote generators available that will turn your website into a 24/7 sales person. Sound too good to be true? It’s not. It’s simple to adopt and reasonably priced. Click-to-Call Functionality: As we’ve determined, most of your customers use mobile devices. This is why having click-to-call is so integral to your customers’ journey. Put bluntly, it doesn’t matter how great your reputation is, no potential customer is going to take the time to track down a pencil and pen, jot down your number, and then dial that number. Click-to-call functionality allows them to move seamlessly from browsing your website to having a conversation with a real-live person, all with a single tap. Implementing click-to-call functionality on your website is not difficult, all it takes is a few lines of code. Mobile Responsiveness: If we sound like a broken record, it’s for good reason. So hear us out, again. Your website needs to be responsive – which means it needs to automatically resize and adapt to visitors using mobile devices. When designing a website you need to think mobile first, not mobile last. Not only is this good for potential customers, but it’s also a factor in search engine rankings. That said, mobile accessibility today is crucial. In 2016, there were 2.6 billion smartphone subscriptions globally. It’s estimated that this number will grow to 6.1 billion by 2020. According to Google, 2016 was also the first year that mobile searches beat out desktop and laptop-based searches. 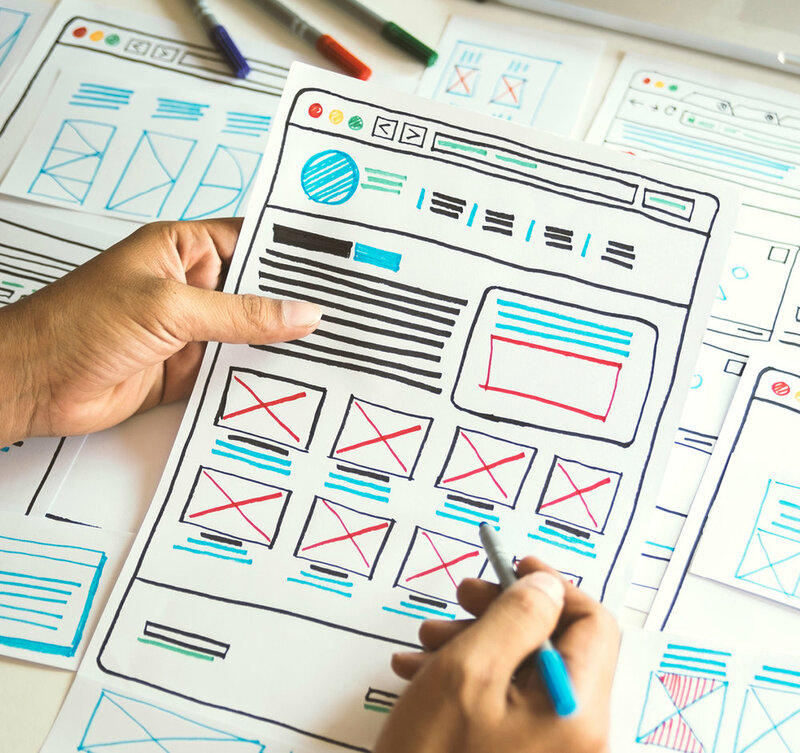 Of course, this leaves most business owners with a question: Should businesses focus on creating mobile websites or responsive websites? We suggest focusing on a responsive site, and Google would agree. Not only does Google not like indexing mobile-only sites, it pretty much doubles your costs and maintenance needs (managing two sites is more expensive than one). When you build a responsive site, you get away with building just one site, opposed to building both a desktop and a mobile version. When going this route, Google will also only have to index and rank one site, opposed to two. It’s easier, more cost-effective, and delivers a better customer experience when done correctly. 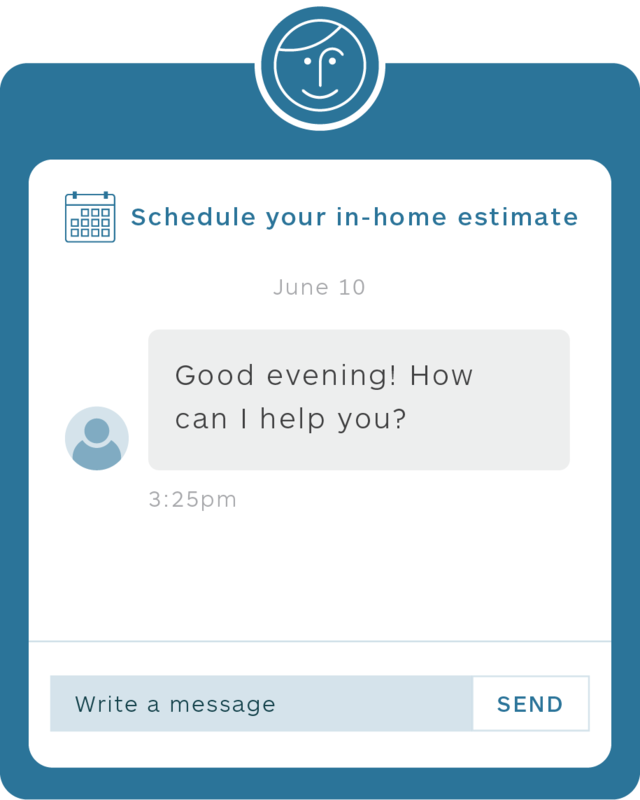 Chatbots: Chatbots are robots that appear to look like live online chat. However, they’re not actual people, but bots that are programmed to chat with web visitors in a particular workflow. You've probably interacted with a chatbot at some point in time without even knowing it! And, by 2020, nearly 85% of web interactions will be with chatbots. If artificial intelligence (AI) for your moving company website seems too “out there,” just keep an open mind. Yes, chatbots are what we might refer to as ‘advanced marketing’ but that doesn’t mean setting one up on your website is too difficult or out of the question. There are plenty of chatbot services on the market that can get you up and running in no time, and the benefits are huge. Instead of a potential customer coming to your site during non-business hours and leaving immediately because they can’t find the answer they need, a friendly and helpful ‘person’ can answer their questions and keep them engaged. If the questions become too complex for your bot, it’ll inform the potential customer that a person will get in touch with them during business hours. No, bots can’t replace real-live humans, but they can keep a lead engaged long enough to push them along the funnel. Though it’s important for your website to have an appealing design, your site must be a lot more than a pretty face. It’s important that you use it as a tool to build trust with your customers. Make sure you highlight all of your company’s best features, as well as your experience and expertise. Show your customers how long you’ve been in business, proudly display trust seals and logos, include information about any specialty experience you have, and display an easily-accessible statement about the transparency of your rates. If you’re in need of a little inspiration, check out these top moving company websites. These websites have gone above and beyond to bring both their leads and customers a seamless user experience. There are over six billion searches done on the internet every day and 67% of these searches are happening on Google. Since Google is the top dog when it comes to search, we’re going to concentrate our focus there. Search Engine Marketing, SEM, is one of the most crucial considerations for moving companies. 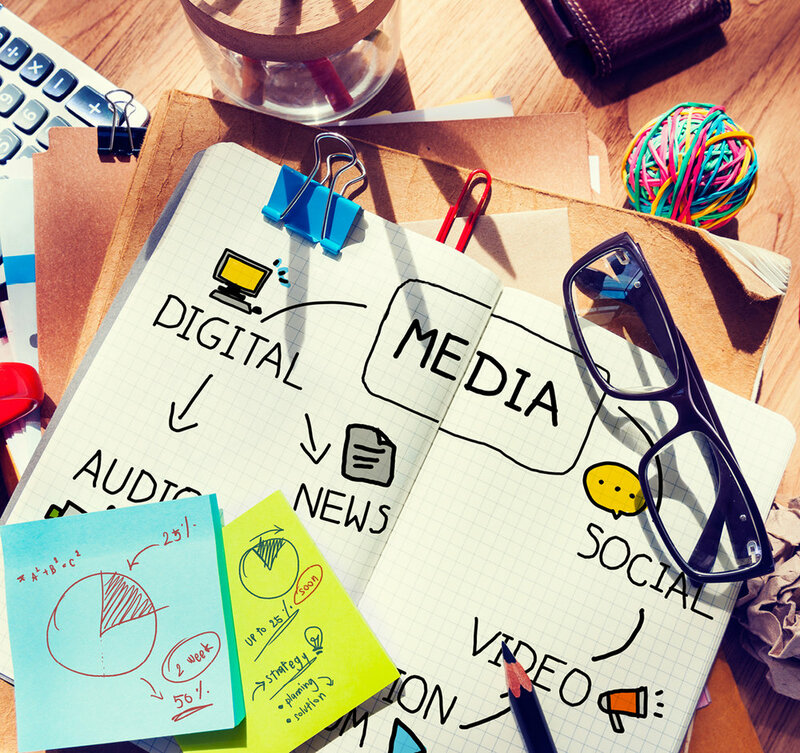 Social is important, blogging is essential, and PR is a must. However, search is really the primary driver of website visits for most moving companies. If you’re failing in your SEM, then you’re not going to see the traffic you need for success. So what exactly does SEM entail? It’s multifaceted, so let’s break it down. You’ve probably heard of both, but what’s the difference between the two you ask? Let’s start with SEM. Pretty straightforward, right? SEM is a culmination of all your efforts that help your website, and ultimately your business, be found on the internet. That brings us to search engine optimization (SEO). Ultimately, you can think of SEO as the bread and butter of SEM. Without SEO, SEM wouldn’t really exist. Now that we have that covered, let’s dive into what you should know about SEO. As mentioned above, the goal of both SEM and SEO is for your website to rank the highest that it possibly can on a search engine result page (SERP). What that means is that if someone Googles “moving company Staten Island” and you’re a moving company based in Staten Island or that services Staten Island, you want to come up as close to the top of that SERP as possible. Below is exactly what that would look like on an actual Google search. The reason you want to be higher on the search results is that websites that appear closer to the top of a SERP get more clicks. Significantly more clicks. A website appearing in the first position of a SERP gets 32% of the clicks for that search for desktop and 23% for mobile, according to Advanced Web Ranking.  For the website in the third position, however, that percentage drops down to 9% for both desktop and mobile. Depending on how many people are searching for a given term, the difference can be astronomical. Search engines — Google specifically — are picky. Ultimately, Google wants to make sure that their users are having the best possible experience and have access to the best possible content they can. In order to do that, they’ll rank different websites/pages and reward (or penalize) them depending on whether they contain top-notch quality content. This can mean anything from how your website is designed and whether it is mobile responsive, to the quality of the blog content you are posting. Even minor elements, such as broken links, Google takes into account and either rewards or penalizes your website. So what does Google want? Below are a few easy and actionable steps you can take to help your website rank higher. Create great page titles and descriptions. Google wants to ensure that you are providing high-quality content. One way it measures this is through engaging page titles and meta descriptions (160 characters or less that summarizes what a page is about). A great page title and meta description should accurately reflect the content on a page. If you’re looking to dive deeper into meta descriptions, we recommend starting with this article that covers all the basics, and then some. Google is smart but it can't read images. So make sure that all of your images have alt text. Alt text describes the appearance of an image on a website. It’s not only helpful for your SEO ranking but works with screen readers that assist those that are visually impaired. Just like you want to provide quality headlines and meta descriptions, the same is true for the actual copy of a page. The more informative and relevant that content is to a specific search on Google, the happier Google (or any search engine) will be. Keywords/match phrases are super important. Phrases such as ‘best moving companies’ and ‘moving companies Dallas’ are all phrases that can help people find your business that are searching for moving companies. Including these keywords/phrases in the copy of your website and on blog posts is essential. Just be careful not to do what marketers refer to as ‘keyword stuffing,’ which means using keywords anywhere and everywhere. SEO these days is more nuanced than that and Google will catch on. They’ll also penalize you for trying to game the system. It’s a big no-no. The match phrases that you will want rank to for are pretty straight forward, as mentioned above. But if you want help identifying words you might use on your blog, there are a variety of free tools that can help you do this. 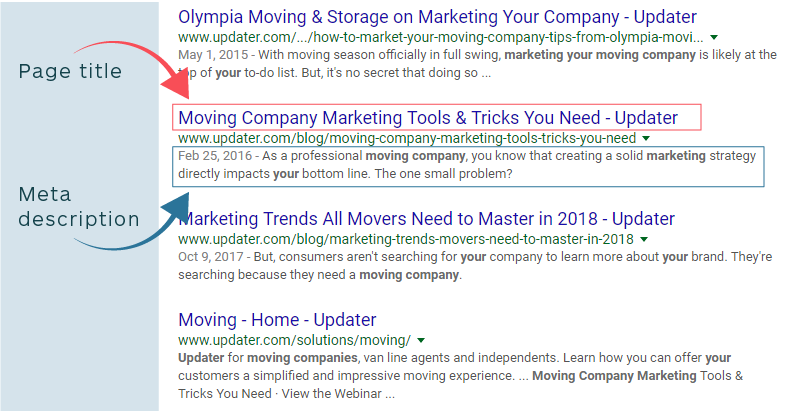 To see how using match phrases can benefit you in search results, go to Google right now and type in ‘SEO for moving companies.’ After the advertisements, what do you see in the second position? Probably an article titles SEO for Moving Companies: Your Quick-and-Dirty Guide. Guess what? We wrote that for our parent company, Updater! We identified the matchphrase ‘SEO for moving companies’ and decided it was something we should rank for. We then followed our own advice and are now ranking in the second position. Some match phrases and keywords are going to be harder to rank for than others, but the process is the same for all. Keep content fresh, relevant, and updated. It shows Google that you’re paying attention and taking the time to update when necessary. Get other people to link to your site. This is also referred to as backlinks. One way Google identifies whether or not your content is high quality is by how many external websites are linking back to your website — the more the better. If these websites are determined by Google to be quality websites, that’s the best case scenario! Long URLs are not only harder for humans to read, they’re also not loved by Google. So when in doubt, go for the shorter URL. Think of it this way: If it’s hard for a human to read, it’ll be hard for Google to read as well. Https is the secure version of http. The ‘s’ means that data exchanged through the site is, well, secure. Why does this matter for your SEO? As for many things in SEO, it’s all about keeping Google happy. Way back in 2014, Google announced that websites that are not https could take a hit in ranking. This blanket statement is Google’s attempt to make the internet safer for all users. While SEO isn’t all about keywords and match phrases, they still play an essential role in your marketing strategy. You need to identify and understand the keywords (and their variations) that apply to your moving company. Once you identify these, you can start incorporating them into your content and building a strategy out around them. As mentioned earlier, you need to make sure that those keywords/match phrases appear in the copy of your website, in your blog posts, in your social media content, and anywhere else they might be applicable. Finally, if you’re not bidding on your own keywords in AdWords, Facebook ads and other PPC platforms, you’re missing out. However, this tactic can become expensive. if you’re budget doesn't allow for it, don’t stress. Working on your website’s organic SEO value is a great place to start. 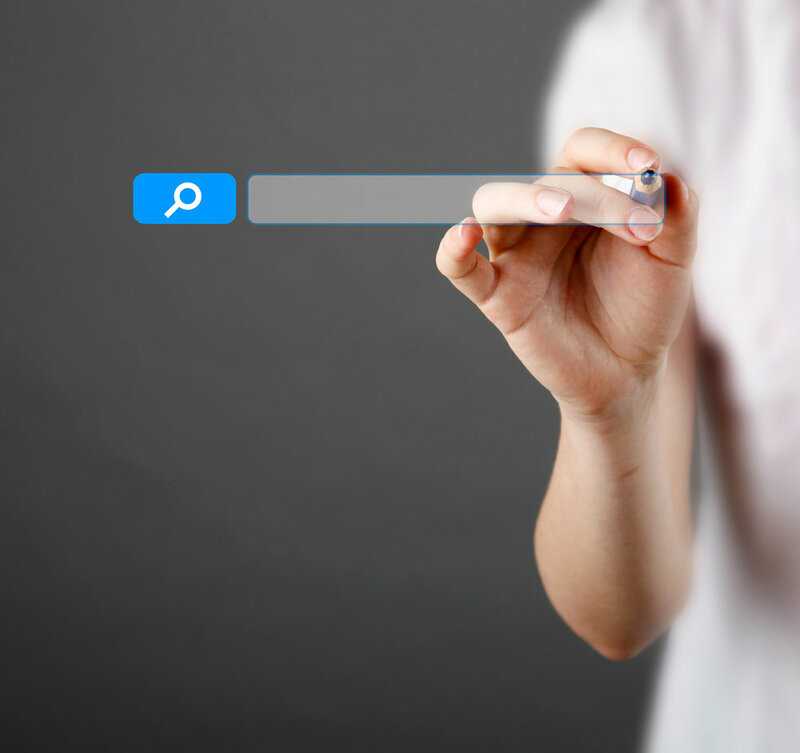 While the internet itself is quickly widening and expanding, so too is the world of search. Though we’ve just gone on and on (and on) about SEO and how it relates to your website, search goes much further than your own domain. Consider the fact that tweets are now indexed by Google and displayed in search results. Facebook is even getting in on the action and has its own internal search engine. 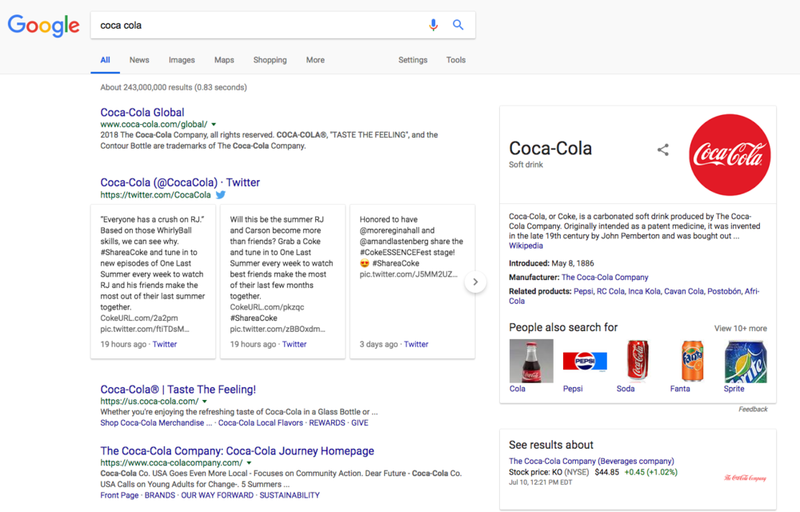 This blurring of the lines between social and search reinforces another important point: You need to stop thinking of your website and your social channels as being somehow different or separate, they’re not. They’re simply two parts of your overall web presence. As such, they need to connect to one another, as well as to your overall messaging and branding efforts. Search engines are also getting smarter. As machine learning increases and algorithms improve, it becomes more and more important that you pay attention to search, and that you use it correctly. OK, this might seem overwhelming. But a lot of it is about creating healthy habits for your website. Also, at the end of the day, search and SEO are really all about the bottom line. The more likely you are to come up in a person’s search result, the more likely they are to become a paying customer. So repeat after us: “Go for the SEO!" Key Takeaway:You want to appear as close to the top of a Google search result as possible. Publishing fresh and informative content — while leveraging the use of keywords and match phrases — can get you there. While your blog is an integral part of your website, we’re actually going to treat it as a separate topic. Why? Purely because of the sheer number of moving parts involved. You might think that because blogging has been around for so long, it’s lost some of its power, but that’s simply not the case. Let’s take a closer look at why you should be blogging, how you can begin (if you’re not already), and the benefits you should expect to receive. Blogging was once the original form of social media, and as such, it’s one of the oldest and most powerful digital marketing tools available. The amount of time it’s been around for has allowed companies to constantly find innovative strategies and ideas to implement in blogging. Here are a few impressive stats to keep in mind. Of course, there are other reasons you need to be blogging. How often are your website pages updated? How often do you publish new content. Probably not all that often. Blogging keeps your site fresh and every single post is another chance to be indexed and found online by potential customers. And, as mentioned in the SEO section of this guide, blogging also helps with SEO. The more high quality content you publish on your site about specific topics, the more likely you’ll come up in search results when customers Google related questions to that topics. Now that you know why you should be blogging, it’s time to bite the bullet and start writing. Begin by writing about what you know best – moving. You can easily create posts that deliver important information that anyone planning a move needs to know. From packing techniques to how-to guides to industry breakdowns involving costs, you’re the expert in your industry, so let your knowledge shine through. 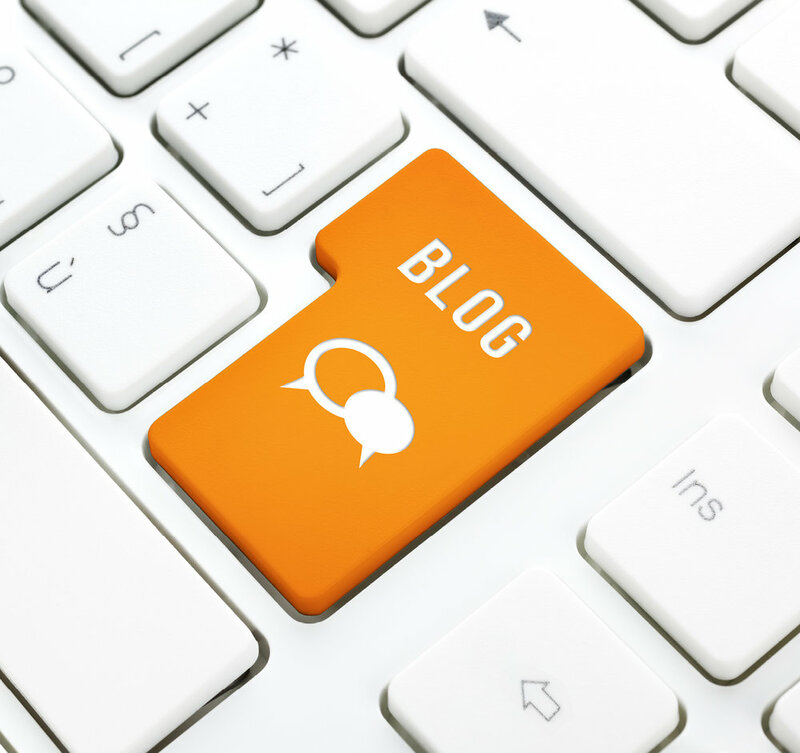 Blogging allows you to position yourself as a thought leader in your field, so take advantage of this opportunity and blog about what matters most to your company. You should also feel free to branch out to other related topics. Consider adding city guides that inform your audience, or create posts that highlight what makes your company special. These will provide added value to your customers, as well as an SEO bump. Team introductions — put faces to your team! Key Takeaway: Blogging is a fairly simple form of digital marketing, with fast and significant ROI. Start off slowly with a post a week and, over time, gradually build your volume of content. While you may feel that you should have reviews available on your website, that’s not always the best strategy. Instead, or in addition to, make sure you have links to credible review sites like Yelp, where potential customers can read unbiased reviews from past and current customers. We all know that reviews are not always the friendliest. People are more likely to review a business when they’ve had a negative experience, opposed to a positive one. Thus, the cards are stacked against moving companies from the get-go. Regardless of this injustice, don’t get mad at Yelp but get even by actively managing your online reputation at all times — claiming and updating your profile on review sites while carefully managing and responding to complaints. Remember that word of mouth, no matter how happy your customers are, isn’t enough to maintain your reputation without an online presence. More and more, consumers are using review sites like Yelp to learn about a company, understand the experiences of previous customers, and determine whether or not they should do business with said company. Think of customer reviews on Amazon, for example. If an item has a rating of two stars, chances are, you’re going to pass on it. If it has three out of five stars, you might consider it, but probably not. Four out of five stars mean that the product is probably pretty good. Five stars signals a must-buy item! The same thing applies to your moving company, even though you’re offering a service rather than a single product. Yelp and other review sites make it easy for people to read others’ reviews, but also to post their own. All of these reviews (the good, the bad, and the ugly) create your online reputation, and you need to manage that reputation actively. Don’t be shy about using positive customer reviews in your marketing. Your website and even your social media channels can benefit from these. Social proof is one of the single most important elements to successful a marketing strategy. Leverage those five-star reviews and make them work for you, you earned them! First and foremost, you need to make sure your website is connected to all of your review site URLs. We’ve already mentioned Yelp a few times here, and it’s probably the most important, but there are plenty of others such as Google Reviews and FourSquare. But since Yelp is the most prominent and widely used, we’ll use it as an example. Yelp has a few useful functions for your business. Yelp’s Request A Quote feature allows you to respond quickly to requests made not through your website, but through Yelp itself. This adds credibility to your business and saves your customers time. Saving customers time equates to quality customer service. Since quality customer service means happy customers, anything that helps your customers do the former is a major win! To help manage your online presence, make sure that you install the Yelp for Business Owners app on your phone. It allows you to take full advantage of all of Yelp’s features and gives you a simple and easy way to take action when a less-than-stellar review is posted. No matter how good a product or service, every company will receive some negative online buzz, so you need to address it as soon it happens, not days later. Managing negative feedback from unhappy customers can be tricky, so you need to have a concrete plan of action for the rare occasion you receive a less-than-stellar comment or review. Acting on emotions risks further damaging an already-strained relationship with a customer, and can even drive off potential customers. Instead, reach out to the person who left the negative review and learn more about the situation. You want to know what upset them and what you can do to remedy the situation. But before reaching out, reference whatever data or information you have on hand about them or the incident. Being informed going into a discussion with a customer will show them that you care enough to take the time to investigate the issue before reaching out. At the very least, you should know their name (if different than their online username), where they are in the process of their move, and who they have been working with from your staff thus far. Remember, public comments should be professional and courteous but don’t underestimate the power of privately messaging unhappy customers. This allows you to have an honest conversation outside the public sphere. To learn more about managing your online reputation, download this eBook from our parent company, Updater: How to Manage & Improve Your Online Reputation. In an ideal world, your company wouldn’t receive a single complaint or have a single disgruntled customer. Spoiler, we don’t live in an ideal world. The good news, however, is that dealing with a minor complaint (or even in some cases a major one) in a professional and courteous manner can often turn an unhappy customer into an appreciative and loyal advocate. Showing that you care enough to take the time and fix a sticky situation displays the level of customer care and commitment your business employs. Key Takeaway: Every company will receive some kind of negative online buzz, it’s how you deal with it that matters most. Follow our 3-step process above to streamline your response. 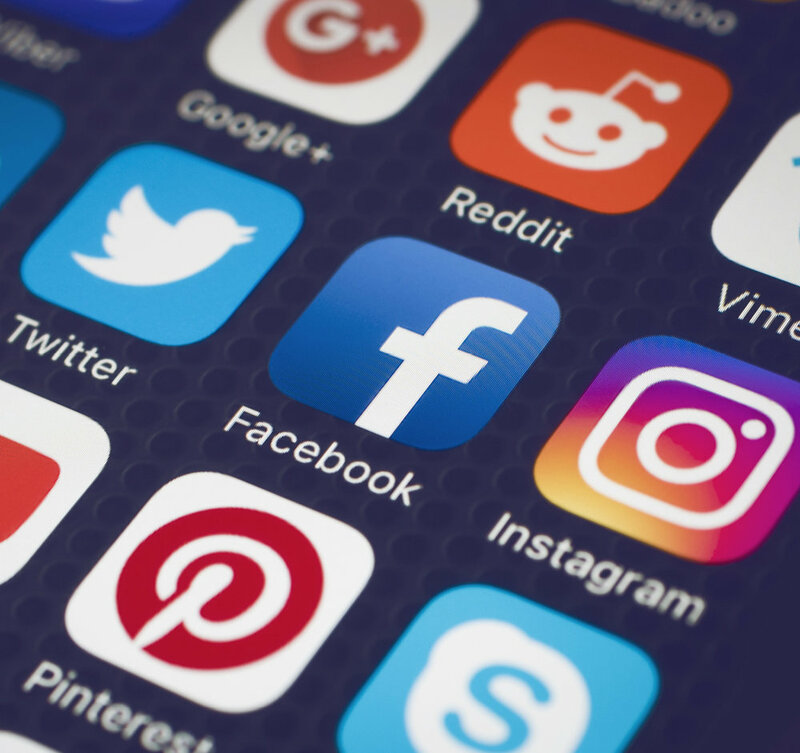 We touched briefly on social media in our section on The Keys to Modern Marketing, but social is such an important aspect of your overall marketing plan that we want to take a closer look. You’re now at the point of creating content, your website looks great, and your positive reviews are pouring in. Now you need to share all of this good news with current customers, potential customers, and the industry at large. Enter social media! You’re probably already using social media in your personal life, but it’s also an incredible tool for movers that far too many companies aren’t using correctly, if at all. There’s a misconception out there that you need to have a massive social strategy with a dedicated individual to manage it. Yes, those kinds of resources would be nice, but just because you can’t spend thousands of dollars on social, doesn’t mean you can’t create a solid social presence and leverage it to your advantage. Just because there are dozens of social platforms out there, doesn’t mean you have to be, or should be, on all of them. While certain ones might be great for your business, others can result in a waste of time and money. The key here is to identify the right channels for both the moving industry and your business. Platforms all have their own unique pros and cons, so it’s important to first determine what you’re looking to gain from a social presence. Are you looking to generate leads? Looking to revamp the brand of an older company or launch a brand for a newer one? Before you even choose your usernames/handles, identify your needs and do your research on potential social platforms. For instance, did you know that ad recall on Instagram is higher than on most other networks? Combine that with the fact that they’re now offering sponsored posts, and Instagram marketing might be far more successful for lead generation than using a platform like Twitter. While you’ll find that social networks vary considerably in terms of value for your marketing efforts, Facebook is the one network you cannot afford to neglect. It’s absolutely massive in terms of reach and audience (clocking in at nearly two billion users worldwide), but it also delivers powerful tools that allow you to hone your marketing efforts. 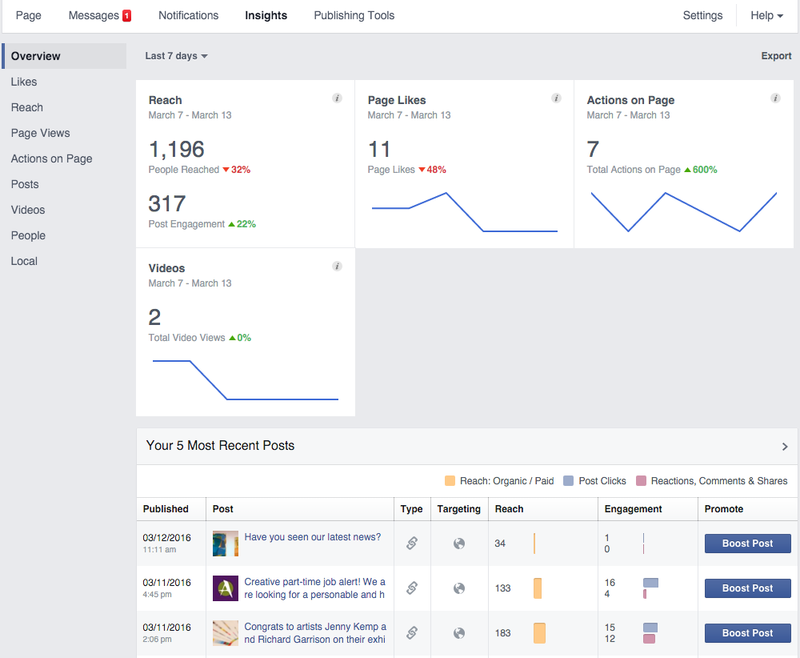 Facebook Insights offers many opportunities for marketers, allowing you to really drill down into your audience, laser target specific demographics, and increase your ROI significantly. Even the Facebook Pages app offers some pretty important functionality, including the ability to edit photos right in the app, and even reorganize your company’s page so that the most important sections show up near the top where your audience is more likely to see them. Through Facebook Insights, having a good concept of who your audience is can drastically assist you in your paid Facebook advertising. A robust Facebook advertising campaign can be complex, but setting up simple ads to test potential audiences is fairly straightforward. With Facebook, it’s all about testing variations of ads (whether that be with different copy or graphics) and seeing what performs the best. Here’s a brief introduction to get you started with Facebook advertising. Social media marketing can be time-consuming, particularly when you factor in the need to actually create posts, not just rely on ads being displayed to your audience. Automation tools like Hootsuite give you the ability to schedule posts ahead of time and even automate the posting process. Hootsuite also offers important functionalities and metrics that make your social media marketing easier. Remember, real and honest engagement with your fans and followers is one of the most important keys to effectively leveraging social media. If you’re not prepared to engage, you will not see the ROI you need. Key Takeaway: Social is a powerful tool for moving companies — specifically Facebook. Focus on identifying your audience and delivering engaging content that solves a pain point. You might not think that PR matters much to your moving company, but it does. It’s an extremely important consideration, particularly if you’re interested in getting your company featured in the media. While there are no guarantees that a journalist will pick up your story, there are a few ways that you can improve your chances. Though nurturing a relationship with the media can take months, here are a few ways that you can grab the attention of the media in your area, whether that’s a newspaper, radio show, or TV program. Go for the low-hanging fruit. By this, we mean obvious things that can be parlayed into an advantage. For example, if you’ve started a recent initiative or new program, write and distribute a press release. Maybe you started focusing on the environment and are taking steps towards having your company go green. That’s a great story, so let the media know! If you think companies only receive press for large, industry-altering changes such as acquisitions or going public, that’s hardly the case. Media outlets, especially local outlets, love to cover smaller human interest stories about small and medium-sized businesses. It makes them look good by keeping in touch with the community. Take advantage of this. You’re a great company, doing great things, let the world know! Conduct a customer survey. Surveys are incredibly popular, particularly with online media. Conduct a customer survey on anything relevant to your business – things people wished they’d known before moving, moving best practices, customer satisfaction, you get the idea. Then, publish these results on your website, blog, and social channels. Better yet, reach out directly to a journalist with your stats. We live in a metrics-obsessed world and journalists eat data for breakfast. Develop a unique customer appreciation strategy. The media loves to see companies doing things differently, and customers love to be appreciated. Thinking of a new way to show your appreciation for your customers is a great place to start. It doesn’t need to be limited to discounts – throw in free packing supplies, or host an actual customer appreciation day celebration. We could write a whole eBook on customer appreciation, maybe we will! But when it comes to stellar customer appreciation, the sky’s the limit. Appreciating your customers in a unique way, one that has never been done before, is a one-way ticket to PR success. Media outlets love to cover partnerships. Co-host a moving workshop with other businesses. Moving, as you know, is more complicated than most people think. You can gain attention by hosting a workshop that soon-to-be movers will attend, co-sponsored by other local businesses. It’s not only a great way to acquire valuable press coverage, but can also spark business partnerships for your company to leverage at a later date. Key Takeaway: PR is all about the story. You’re a great company, doing great things — find your story and scream it from the rooftops. Marketing is hard. But worth it. If you haven’t figured it out by now, marketing anything — whether a product, service, or business — is a big undertaking. At MoveHQ, we like to stress that marketing never ends. There is always something new (or old) that needs to be optimized, updated, written, or pitched. It’s a never-ending gig. With that said, we know that some moving companies have dedicated marketing teams, but we’re also aware that some don’t. For the latter, those companies working with smaller budgets, don’t assume that a comprehensive marketing strategy is out of reach for you. It’s not. Sure, you’re not going to have a dedicated social media guru, but most places don’t. The important thing is to start off small — identifying your needs, prioritizing your projects, and mapping out your strategy. There is no one-size-fits-all marketing plan. Take it as slow (or as fast) as you need/can, and remember to always keep track of your wins and losses. The more data you collect on your marketing initiatives, the easier it will be to tweak and optimize YOUR projects going forward. Now go forth, market, and conquer the moving industry!